Comes, Roland, a very superficial, ignorant, unweighing varlet, to draw me out of retirement with yet another claim that I, the sweet swan of Avon, did not write the plays, the poems—any of the works I’m credited with. I’m surprised that the director of Independence Day and Stargate doesn’t think some alien wrote my plays. In response to your laundry list of “evidence” for Edward de Vere’s authorship, may I mention only this, that Sir Edward died in 1604, and by most accounts I wrote The Tempest in 1611? But what if all of those scholars are wrong? What if your man wrote the play before dying? After all, some addle-pates have suggested the play was written as early as 1603. If that’s the case, how do you explain the play’s explicit references to documents from the New World not available until 1609 or later? Thus, unless our noble kinsman was clairvoyant or his presumed talent extended beyond the grave, I’ll warrant that only a clouted clapper-clawed blind-worm could believe that he wrote the play. And what about The Winter’s Tale and Cymbeline? Both were composed after your man shuffled off this mortal coil. All I have to say is, that’s one busy dead man! As for the conspiracy of silence, do you really think the back-stabbing, flap-mouthed wag-tails I hung out with would keep mum about such a juicy bit of gossip? All of them? For all time? But if this evidence is not enough for your too credent ear, list. I invite you, thou impertinent clack-dish, to get all CSI on the case and carbon date the coffee ring you’ll find on the first page of the quarto (foul, of course), tracing it back to that London Starbucks hard by my beloved Globe. Drop by. Ask around. They’ll remember me. Especially Mariana, the barista who was the true model for the dark lady of the sonnets. “Inky” she called me. Oh, Roland, Roland! Unless I’m reading my Hollywood Reporter incorrectly, more people went to see a junior high production of my Caesar in Anytown, America, than attended your little theatrical. May it rain potatoes upon you, thou loggerheaded folly-fallen hedge-pig! What? Still not sated with evidence, thou beef-witted motley-minded miscreant? Then list harder. Hear thou that faint ka-ching? That’s the old dough-re-mi dropping into my Swiss coffers every time one of my plays is performed, my lines quoted, my name invoked. 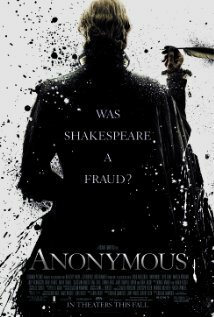 I get a cut, even, of every ticket sold for Anonymous (all twenty-three of them). To these aged eyes, boy, that’s what winning looks like. Most shallow man! Hast thou or word, or wit, or impudence, that can yet do thee office? Nyuh-uh! Didn’t think so! Go thy ways, thou vain hasty-witted pignut! Just when I thought I was out, they pulled me back in. Oh yes, you didn’t know? I wrote The Godfather, too. Retirement hasn’t been all Mah Jongg and Mai Tais, you see. Again I write to you from my lonely vigil in the Occupy My Recliner movement, my stand—or recline—against tyranny. I’ve had it up to here with taking orders from The Man—or, actually, The Woman—since it’s my wife giving the orders. Dig this: she refuses to let me use the mortgage money to buy a home theater system! Plus she makes me clean up after myself. I am the 99%! And I’m not going to take it anymore! Back now. So where was I? OK, the point is the timing couldn’t have been better for Tower Heist, released during the height of the Occupy Wall Street movement that’s taking place around the country and the world. And for the flying cutlery that followed me out the door as I escaped to a matinée. It’s in the same vein as Paul Schrader’s Blue Collar (1978), about a band of blue-collar amateur thieves who commit a crime for a good cause. Here, the good guys set out to rob an evil one-percenter who has bilked millions from innocent investors. It’s not a great movie, but reviewers who are knocking it for not being funny enough are, I think, missing the point. I found myself laughing more often than I do at most so-called comedies, though the humor is more often social than silly. In an effort to explain why the evil one-percenter has stolen even from the building’s lowly staff, the Casey Affleck character says he probably needed the cash to keep up appearances. “At a certain point,” he says, “it isn’t about securities fraud. It’s about catering.” You don’t laugh, but you give a painful grimace at the fundamental truth of the observation. For me, that’s worth any number of fart jokes. As the title indicates, at its heart, this is a heist movie. And as in Blue Collar, the laughs begin to die off when the heist begins. As it should be. If the characters joke their way through the heist, we’re less inclined to believe that failure matters or that they’re in any real danger. I have to say that a scene involving an open window-wall on an upper floor of a high-rise gave me plenty of cause for anxiety. And, yes, it was so a large pop I spilled in my lap. It’s a heist movie with a message, about the exploitation of the working class, which may be another part of its problem. We Hammericans not only like our genres clearly defined; we like our comedies simple, with no more than a hint of theme. Here the filmmakers keep the exploitation theme at the forefront, making our laughter nervous at times. The heist itself is outlandish, ridiculous, etc., but it’s played out just realistically enough to make you ignore how impossible it would be for the thieves to do what they do. I’m trying not to include any spoilers here, but let me just say that complications are piled upon complications so that, by the end, only a combination of dumb luck and sprezzatura allows our heroes to pull off the robbery. 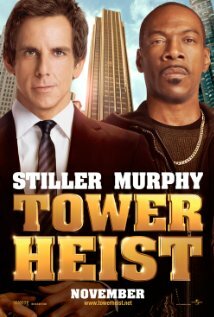 Tower Heist is a movie where the little guy wins, which means it satisfies one of the fundamental myths of our culture. Ben Stiller can be very funny. Here he plays the apartment building’s general manager, a man who’s intent on taking care of his tenants as well as his employees. When he learns that the Bernie Madoff knock-off may have stolen all the staff’s money, his first reaction is to believe that the accused—played with snake-eyed charm by Alan Alda—is innocent until proven guilty. His next move is to question the man himself. His next is to flip out in a rip-roaring rage. And then comes the cold-eyed schemer. In other words, the classic Ben Stiller character. The source of Stiller’s humor is that he often plays a fundamentally realistic character who’s being pushed closer and closer to the edge and then reacts—often over-reacts—to the insanity around him. His character’s deepest desire—here and in so many movies—is to fix things. Think, for instance, of his role in the Night at the Museum movies, each of which is a race to restore order, to get all the museum’s occupants back onto their pedestals and into their display cases. The rest of the cast is strong. Casey Affleck, for my money, is always interesting, and it’s fun to see him in something lighter than what he’s been playing of late. Here he’s the harried father-to-be, who has his doubts about whether he should take part in the robbery. Michael Peña is good as the guy who probably has more experience at robbery than at the job he’s been hired for. And Téa Leoni is good as the put-upon FBI agent who has sympathy for what Stiller and the others want to do, but won’t let them get away with it, if she can help it. Matthew Broderick has some good lines as the out-of-work Wall Streeter who can’t get used to the fact that his entire life has been repossessed. And Gabourey Sidibe is funny as the maid from the Islands who’s desperate for a husband, but not so desperate that she’ll sacrifice the twenty million in the rich guy’s safe. Don’t get me wrong—there isn’t an Oscar-worthy performance in the bunch, but maybe a couple of Felix-worthy ones. If nothing else, see the movie to catch up with Eddie Murphy, who plays an older version of the characters he played so well in 48 Hours and Beverly Hills Cop—a fast-talking street hustler and cut-rate thief. His character, knowing that stealing anything worth over a thousand dollars makes the crime a felony in New York, only robs balconies. “What do you steal—lawn furniture?” Broderick asks. At least one reviewer has found fault with the movie because we can see Murphy’s crow’s feet. Let me take a moment here to explain to the reviewer that that’s because the man is middle-aged! I mean, is the reviewer really suggesting that Murphy should get a face-lift? Sheesh. Murphy gets some of the best lines. My only disappointment is that, while we get to see all the other characters’ fates, we don’t get to see Murphy’s. A quick scene nestled among the credits would have made a nice monk’s gift (to use Roger Ebert’s lovely term). OK, that last observation, the one about the fate of Eddie Murphy’s character? That was The Sleeper’s, not mine. She didn’t sleep a wink, by the way. P.S. Anyone interested in an Occupy Hollywood movement? After all, by some estimates, only 1% of actors make it big in Hollywood. I’ll bet the stats for writers and directors are about the same. Let’s hear it for the 99%!